I took it on the chin that morning – at least verbally – but my daughter and I laugh about that encounter now. She’s an accomplished young woman with astonishing emotional intelligence, and if she hasn’t lost her knack for tactical ferocity, she knows I’m on her side and rarely, if ever, bares her teeth in my presence. Theologian David McCarthy, in a recent book on the Communion of Saints, puts forward the notion of “social desire.” “Our social desire,” he writes, “is our desire for shared life. It is a desire for a meaningful life. It is a desire and hope that my everyday endeavors do not stop with me, that who I am as son, brother, friend, father, theologian, neighbor and coach does not end with how it makes me feel…” Rather, he avers, social desire seeks connection with others in a metaphysical framework that orients us socially, makes us whole in community. The very meaning of the word “grace” is “undeserved favor.” We do not deserve it. If it is deserved, then it is not grace and it is certainly not amazing. Our church’s logo is a shepherd’s staff, based upon the parable of the lost sheep, along with Psalm 23 and the Good Shepherd of John 10. We’ve had this shepherd’s staff with our congregation’s name written beside it out front on our sign since 1979 and it is on our letterhead, Sunday order of worship, and website. This shepherd’s staff is a constant reminder to us and to others of our vocation – who we hope to be and are called to be. More than that, it always reminds us who God is. One problem with the many references to sheep in the Bible is that so few of us have any real contact with these animals. The metaphor is simply lost on us. What does it mean to be compared to sheep? The little we’ve heard or read about them—that they’re not particularly bright—does not endear us to the metaphor. But here’s the thing about Good Shepherd Sunday: it’s not about sheep at all. It is about a shepherd—the “Good Shepherd”—but even that designation is charged with meanings that can be lost on us. “I am the good shepherd,” says Jesus. 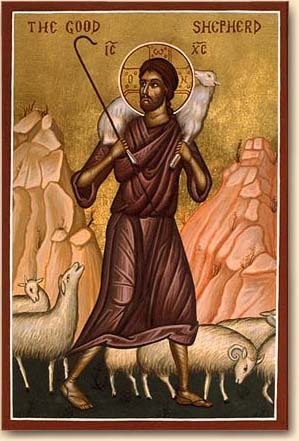 “The good shepherd lays down his life for the sheep” (John 10:11).